AMES, Iowa — The Iowa State University College of Agriculture and Life Sciences and the Iowa State University Alumni Association presented awards at the annual Honors and Awards Ceremony on Oct. 30. Harold H. Hodson Jr. received the Floyd Andre Award. This award honors an alumnus who has made outstanding contributions to production agriculture, agricultural business or who has had a significant impact on Iowa agriculture. Hodson received his bachelor’s degree in 1961 and doctorate in 1965 in animal science from Iowa State. As retired chief executive officer and president of Swine Genetics International, Hodson is a global pioneer and well-known consultant in animal genetics improvement. Early in his career, Hodson served as an ISU Extension and Outreach swine specialist and chair of the department of animal science at Southern Illinois University. His expertise made him a key contributor to national and international organizations, and earned him global accolades. Hodson’s leadership to the agricultural industry continues as a board member for the Iowa Foundation for Agricultural Advancement and the Iowa 4-H Animal U Advisory Committee. Don Koo Lee received the college’s George Washington Carver Distinguished Service Award. The award honors college alumni who have demonstrated outstanding achievement or leadership in making significant, influential or innovative contributions to society. Lee, a professor in the Republic of Korea’s Department of Forest Sciences at Seoul National University and endowed chair in the Park Chung Hee School of Policy and Saemaul Yeungnam University, received his master’s degree in 1975 and doctorate in 1978 in forestry from Iowa State. Lee, recognized as one of the world’s premier forestry scholars, also served as the dean of Seoul National University’s College of Agriculture and Life Sciences. His career includes international service to the forestry industry as Korea’s minister of forestry, president of the International Union of Forest Research Organizations and president of the United Nations Convention to Combat Desertification. His dedication to the industry continues as a key collaborator with world leaders solving issues such as desertification and land degradation. He is a member of the Korean Academy of Science and Technology, Royal Swedish Academy of Agriculture and Forestry and Xi Sigma Pi — and international honor society for forestry and related sciences. James P. Tobin, retired channel engagement lead for Monsanto Co., received the Henry A. Wallace award. The award honors a college alumnus who has achieved notable professional achievements nationally or internationally and brought distinction to themselves, the college and the university through significant contributions. Tobin, a recognized leader in the global biotechnology industry, received his bachelor’s degree from Iowa State in agricultural and life sciences education in 1978. Following graduation he served as a county extension director for ISU Extension and Outreach before beginning a 31-year career with Monsanto. Tobin’s tenure with the organization included leadership roles in agricultural marketing and commercial development, working with customers and products in the biotech and crop, seed and chemical divisions. His knowledge has made him a sought after board member of national organizations such as the United States Farmers and Ranchers Alliance and the American Seed Trade Association. Tobin continues his contributions to the agricultural industry on Monsanto’s Grower Advisory Council, as a board member for United States Grains Council and chairman of the FarmHouse Fraternity Foundation. Lisa Wasko DeVetter received the Outstanding Young Professional Award honoring an early to mid-career college alumnus who has distinguished themselves through significant advancement and achievement in their discipline, field or area of expertise. DeVetter, assistant professor of small fruit horticulture at Washington State University, received her bachelor’s degrees in biology and horticulture in 2007 and master’s degrees in horticulture, agronomy and soil science in 2010 from Iowa State. As a new faculty member, DeVetter leads the small fruit research and extension program for Washington State University, and is an emerging leader in fruit production for the Pacific Northwest. While an Iowa State student, DeVetter spent four years contributing to the college undergraduate service-learning program in the Kamuli district of Uganda. She continues her involvement as an advocate for the Iowa State Center for Sustainable Rural Livelihoods. Robert D. Bullard, dean of the Barbara Jordan-Mickey Leland School of Public Affairs at Texas Southern University, was recognized with the Iowa State University Alumni Association’s Alumni Merit Award. 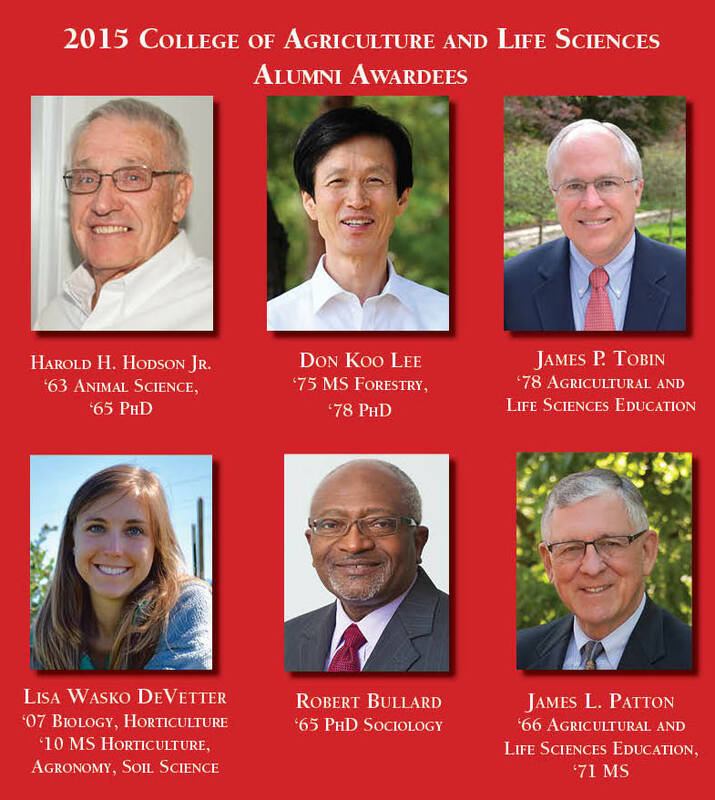 This award recognizes Iowa State alumni for outstanding contributions to human welfare that transcend purely professional accomplishments and bring honor to the university. Bullard received his doctorate in sociology from Iowa State in 1978, and is known worldwide as the father of environmental justice. He has written 18 books on topics including sustainable development, environmental racism, urban land use and community reinvestment. In 2008, Newsweek named Bullard one of the 13 environmental leaders of the century. Bullard has won national accolades for his work, including the Sierra Club’s prestigious John Muir Award, which honors achievement in national or international conservation causes. He was the first African-American to receive the honor. Bullard is active with the NAACP Environmental and Climate Justice Project, the Environmental Defense Fund, the Environmental Justice Leadership Forum on Climate Change and the Historically Black Colleges and Universities’ Climate Change Consortium. James L. Patton along with his wife and fellow Iowa State University alumna, Diane Botts Patton, was recognized with the Iowa State University Alumni Association’s Alumni Medal Award. This premier award has been presented to alumni who demonstrate loyal service to the university through alumni-related activities. Patton, a retired regional director for ISU Extension and Outreach, received his bachelor’s degree in 1966 and his master’s degree in 1971 from Iowa State in agricultural and life sciences education. Early in his career, Patton worked in banking and as an agricultural educator. Patton’s service to Iowa State has included involvement in the Iowa 4-H Foundation, Professional and Scientific Council and Campaign Iowa State: With Pride and Purpose. He was integral in fundraising for the restoration of Morrill Hall, and serves on the University Museums Curators Advisory Council. Patton’s service to community is extensive including active roles with the Ann Ringland-Smeltzer Trust, Rotary International and the Presbyterian Church, USA.